Great product, but should be identified as NOT APPROVED for USPSA competition, so shooters don't mistakenly purchase and then discover they are not permitted in the States. Perfect imho - strong magnets, very ergonomic. I use them with Wilson Combat Mags. Very good item. 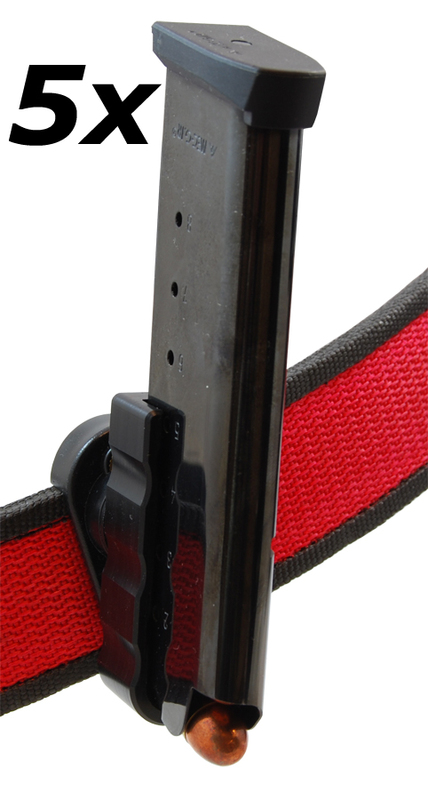 Magnets are strong enough to hold the magazine during an athletic course of fire but the magazine remain easy to pick it up during a reload. Fantastic tool to feed my SigSauer 1911 Target .45 with single stack mags. Good design, and the magnets are strong enough to keep the loaded mags in place. Arrived quickly, as promised. Highly recommended. Great compact design & quality, very happy with my purchase. Great pouches allow rapid access to the magazines. Larger guys tend to knock the magazines out with a lot of movement. Very good pouches. Just dont put them too close together or you can dislodge the neighbouring mags when mag changing in a hurry! It looks like that the magnet is not that strong. A simple bump can release the magazine. My magazine fell twice already without me noticing it! THE PRODUCT IS VERY GOOD AND VERY RIGID. YOU CAN EASILY CHANGE THE ANGLE YOU WANT ANYTIME BY JUST USING AN ALLEN WRENCH. THANKS TO DAA, I AM VERY MUCH SATISFIED WITH THIS PRODUCT. Another Combo offer from DAA which includes 5 DAA Single Stack magnetic pouches.